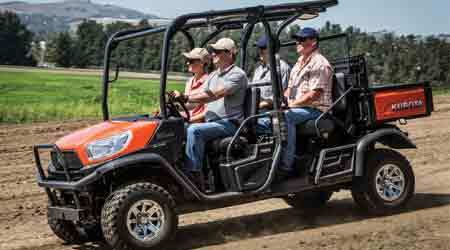 Kubota Tractor Corp. introduces a new addition to its RTV-X Series line. The new RTV-X1140, featuring an innovative Kubota K-Vertible cargo conversion system, transforms the vehicle with minimal effort and time from two passengers and a large cargo bed to four passengers and a cargo bed. Kubota is the top-selling diesel utility vehicle in North America 10 years running, according to Power Products Marketing, North American Utility Vehicle Report, and the company continues to set the standard for ruggedness and reliability. The new five-point ROPS design increases RTV-X1140’s legendary workhorse characteristics allowing for more cargo volume and side loading. The RTV-X1140 also comes standard with hydraulic dump bed with 19.1 cubic feet/9.9 cubic feet capacity, two-seat and four-seat configuration, respectively. The RTV-X1140 delivers a powerful 24.8 horsepower Kubota liquid-cooled diesel engine, work-proven for dependable performance even in the harshest terrains. With convenient tilt steering and simple inline shifting, the RTV-X1140 has a variable hydraulic transmission that offers wide torque band and large oil cooler that boost performance and durability. Front and rear independent suspension on all four wheels ensures a truly exceptional ride enhancing drivability and handling in most off-road conditions. And Kubota raised the bar on ground clearance with the new RTV-X1140, offering a full 10.8 inches of suspension travel with the ability to glide over bumps and rugged terrain. Kubota’s new front 4-point PTO K-Connect for the RTV- X1100C gives it the ability to transform into the ultimate snow removal machine, with four new snow attachments: a 66-inch snowblower; a 66-inch rotary broom; a 78-inch V-Plow; and a 78-inch straight blade. • The snowblower is a 66 in.-wide, two-stage commercial snowblower that throws snow farther than the competition and with less dispersion and more precision for professional grade snowblowing. • The PTO-driven Rotary Broom Sweeper is 66 in. wide and loaded with 34 water brushes that turn at more than 240 RPM, designed for even wear of the bristles and with floating wheel placement to follow ground contour and avoid obstructions. • Kubota’s V-Plow is designed for heavy-duty snow applications offering 78 in.-wide blade to accommodate the width of the RTV-X1100C when fully angled at 30 degrees. • The Straight Blade offers new curvature to better roll the snow, also at 78 in.-wide, the blade can operate in float or down pressure for superior, reliable performance. With K-Connect, these new implements connect in seconds without tools and can be removed easily for seasonal storage. The PTO is gear-box driven for durability, less maintenance and quieter operation. The control handle and PTO switch offer simple and intuitive control for all implements. The control handle is designed for left or right hand operation, with a blue LED indicator that confirms the floating action of the hitch for immediate use. The PTO switch is ergonomically-located and easily- reachable for double action intuitive control, similar to tractor functionality.